We arrived at Tagbilaran Port after two hours ferry ride from Cebu. It was truly a hot summer day. The sea is calm and the sky in the brightest blue. We went straight to Wregent Hotel, which is in the heart of the city. After a short rest, we rode a tricycle to St. Joseph’s Cathedral. It’s grand and its architecture is mix of the old and new. We walked around town to get the feel of the place. We visited Bohol Museum, an interesting place to learn how Bohol island and the Chocolate Hills were formed. 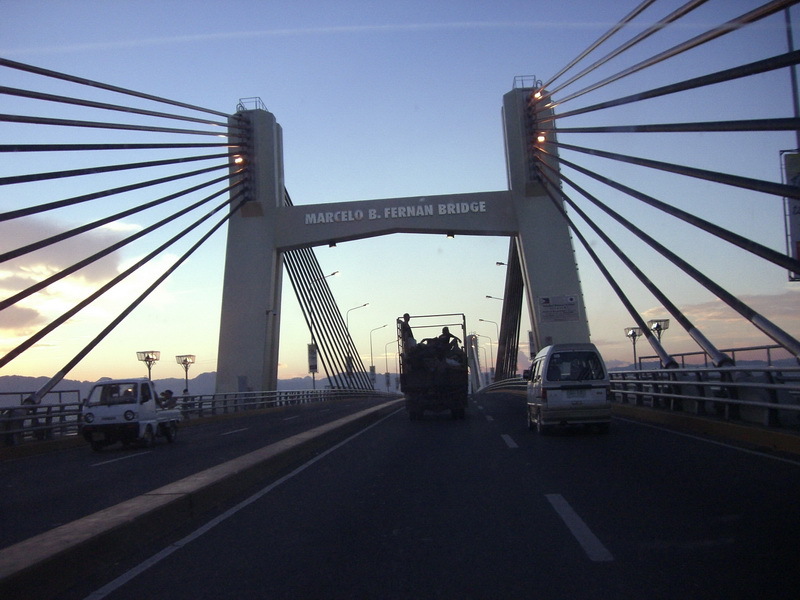 Bohol is where old and new co-exist, in terms of structures. There are Spanish colonial houses as well as new commercial buildings. Bohol is always alive with their people and with their music. Early that morning, we rode a van to Dumaluan Beach at Panglao Island. 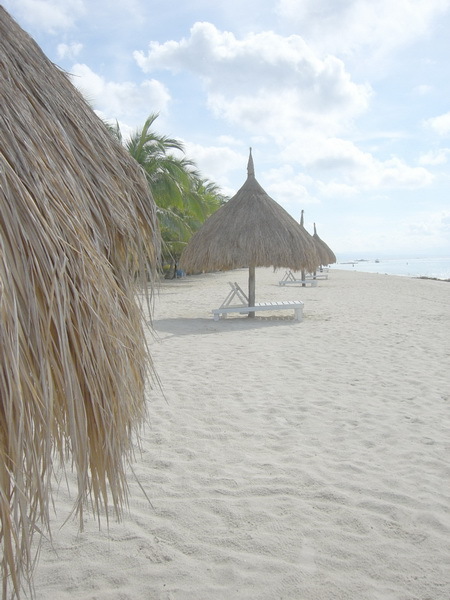 Half of the beach is owned by a private resort and half of it is open for the public. We tried to walk up to the edge of it but it was quite hot so we headed back and decided to eat “kalamay” for breakfast under the nipa shed. We went for a swim until noon and sailed towards Alona Beach, the well-known beach there. 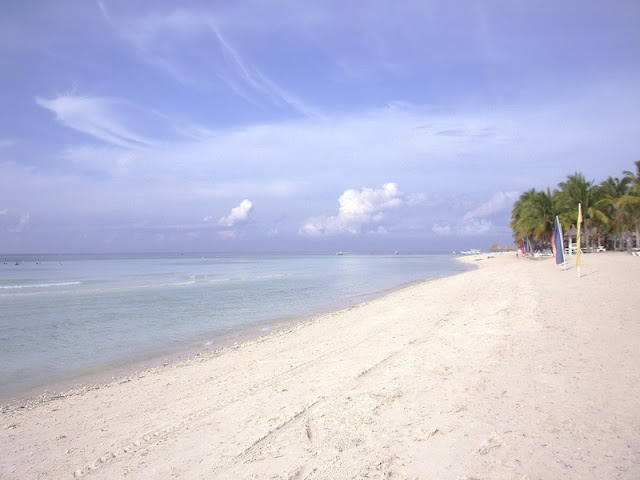 For me I was more pleased with the beach in Bohol Beach Club side than Alona. At Dumaluan, BBC side, the water is very clear, calm and shallow. The sand is a bit coarse at shore but very fine and powdery at sea. Infact, it’s finer than Boracay’s white sand. Oftentimes we accidentally step on starfishes, they’re everywhere. The place is picturesque, and it’s everything you’d like your private beach to be. It’s not crowded and very laidback. That noon, we sailed to Alona and hunted for a place to eat. The boat ride was awesome. The water ranges in color from clear, to emerald and to dark blue. Alona Beach is commercialized, boats are scattered everywhere, the shoreline is not that wide, and the water is deeper. There are lots of resorts. There are few restaurants around, we ate at one open air resto but the food was a bit disappointing, but we were very hungry so we can’t be choosy. We spent the rest of the day there at Alona. On our way back, we went to ICM or Island City Mall for dinner and to make a quick shop. There’s a fabulous pastry shop, Bread Cottage. The Torta Bicolana is a must try as well as the bread with hard boiled egg, which looks like a bird’s nest. Mang Chito fetched us for our day tour of Bohol. First stop is the famous Chocolate Hills. The view on top of the hundred plus steps view deck is great. It’s a nice feeling to be able to see it in actual and not just I postcards. There are thousands of that brownish hills around Bohol. The sky brightened up the backdrop while the fluffy clouds perked up the scene. We made a short stop at the newly opened butterfly farm. The place is simple. Every time they open the gates a butterfly would escape. They have lots of species there, and that’s were I’ve learned that the giant Mariposa is not a butterfly but it’s a moth. 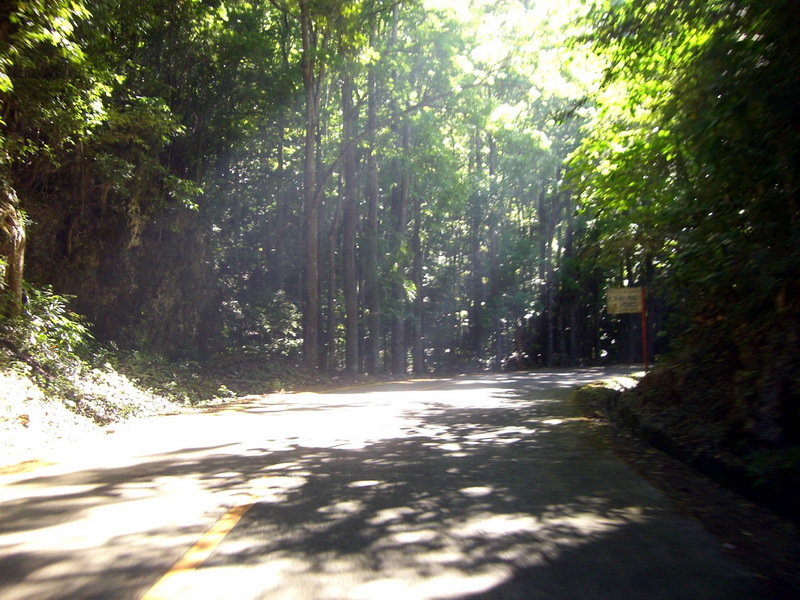 Driving through the roads of Bohol is a breeze due to the newly constructed road. We also stopped by the Mahogany Forest. It’s dense and it’s quite beautiful, somehow with the forest canopy we were spared from the hot rays of the summer sun. The tree planting was a project of the local government 30 or 40 years ago. 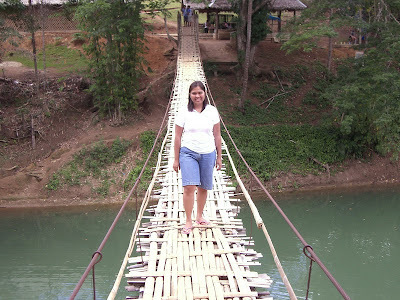 We also went to the Hanging Bridge also known as Tarzan Bridge. 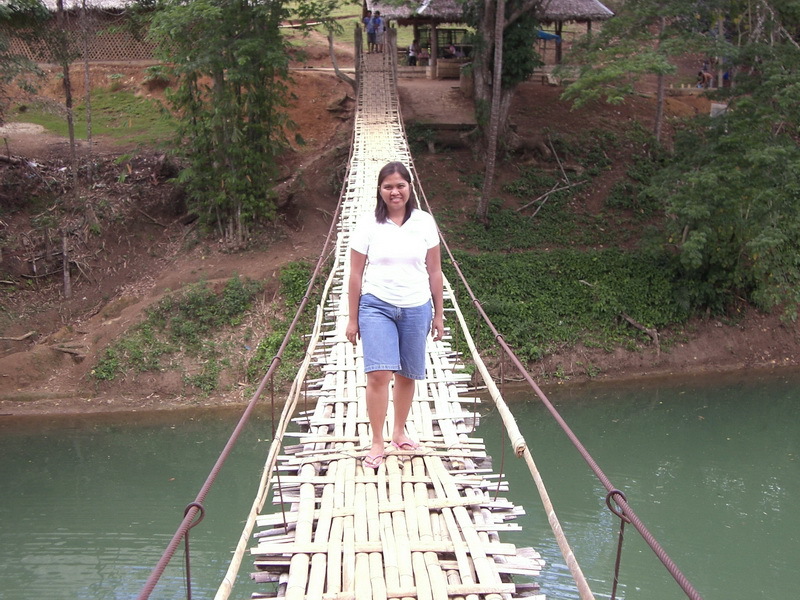 It’s made out of weaved strips of bamboo with steel cables supporting it, so there’s no need to fear. At the end of it, there are souvenir shops and a guy who sells fresh coconut, which my friends really dig. There are so many tourists on the bridge, so it was tougher on our way back. It was also surprising to see “Buko King”, gnawing away the coconut husks. I think it will be harder for him to take on the husk of young coconuts than those dried ones. 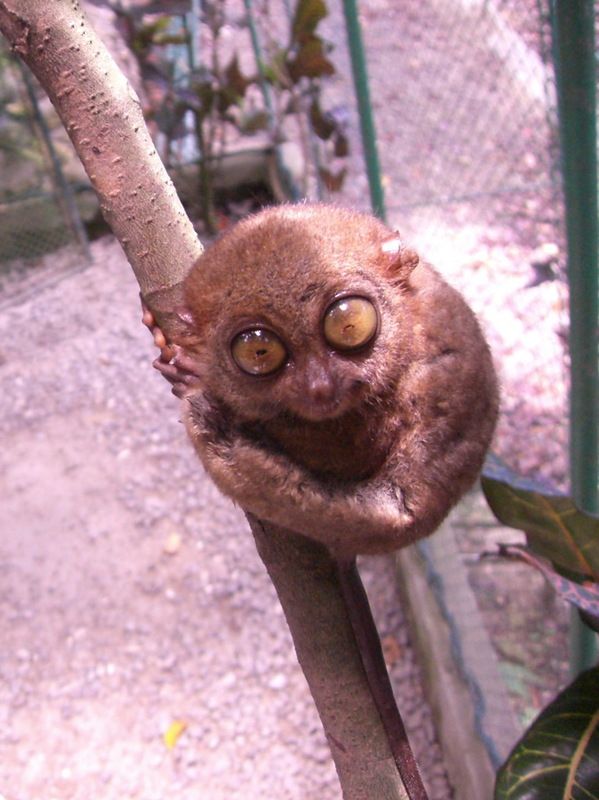 It’s noon when we arrived at the Tarsier Sanctuary. They really are charming and cute. They’re world’s smallest primate. They are also nocturnal so they weren’t that active that time. They have a thick chocolate colored fur, with big eyes blinking, and with long tails. They say they can turn their heads 360. 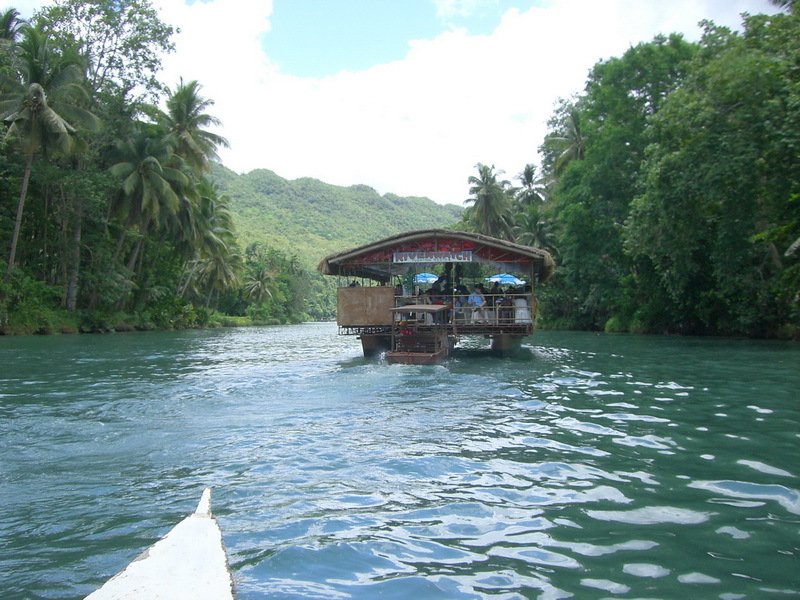 The place is along Loboc River so we decided to take a boat ride. 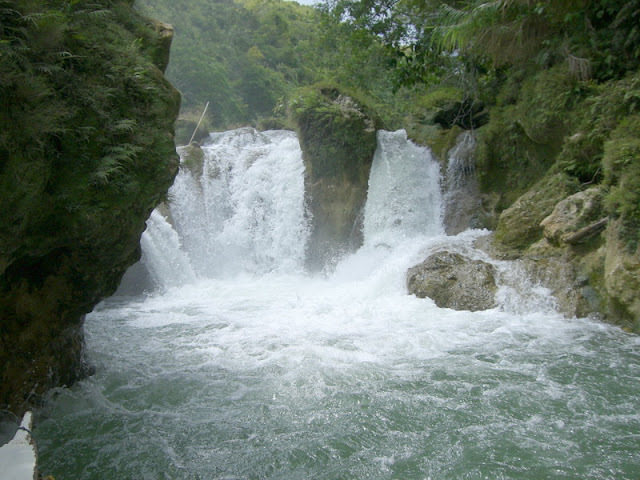 We had two choices, downstream to the nipas or upstream to the falls. It’s a sounding upstream for us. 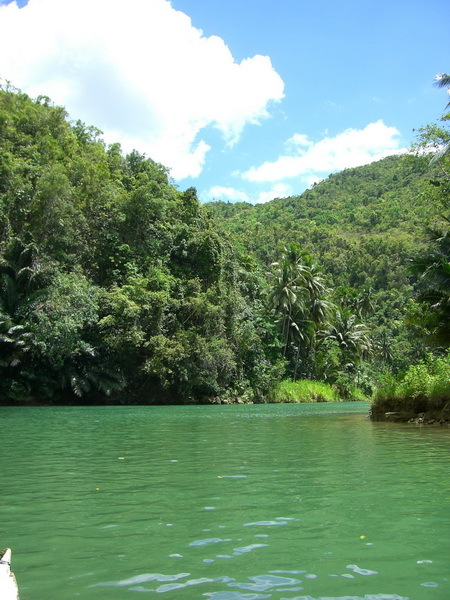 The river is deep green in color and is very alive. We passed by the cold spring, and the resort Nuts Huts which reminded me of a scary movie. There are floating restaurants in the river, but it’s advisable to take boats if you want to reach the waterfalls. Passing along, we were serenaded by the children’s choir and they also danced for us. Then we entered a cove guarded by a century old tree. We reached the twin falls at the end of the river. Back on our tour, we headed for the Loboc Church, the second oldest church in Bohol. We visited the museum; it somehow explained that music is always a part of Bohol. We heard the Loboc children’s choir practice their pieces for their 2pm concert. The church is in need of restoration but still there wasn’t any help coming from the government. After that we visited Prony, the largest python in captivity. He was asleep but when I was infront of him, he woke up suddenly, maybe mistaking me for his big lunch. We were also entertained by Marimar, the gay guardian of Prony, who claims to know 25 languages. She sang, danced and even done cartwheels for us. 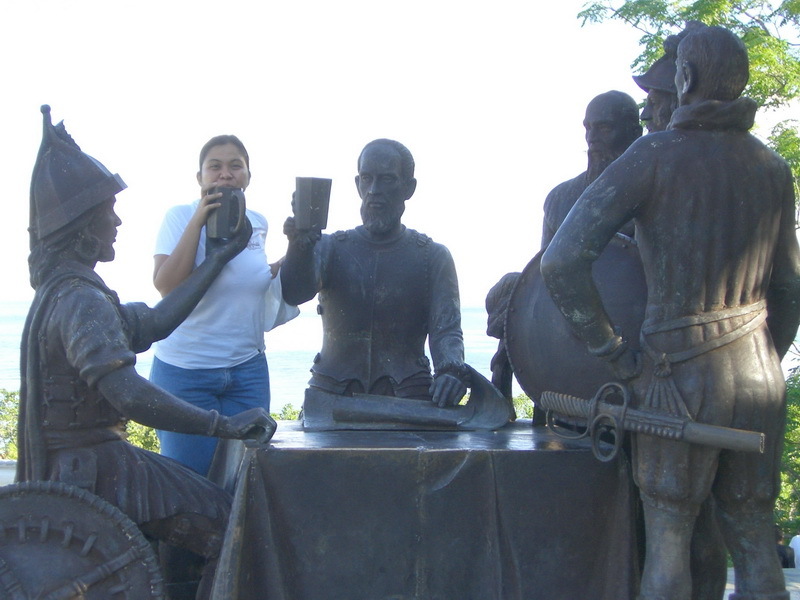 We drove to Sandugo site or Blood Compact Site, it is where Raja Sikatuna and Miguel Lopez de Legaspi did a peaceful blood compact. Not like what happened in Cebu, where Lapu-lapu killed Magellan. 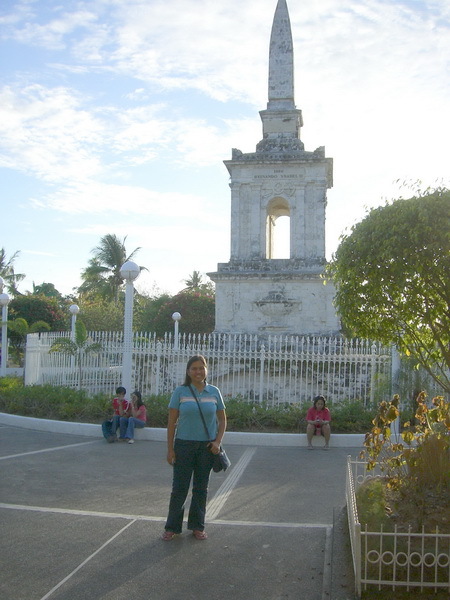 The oldest church in Bohol, built during the 1520’s with limestone and egg whites. The church is fronting the sea. At the museum, the view from the window is awesome. The Spaniards colonized the Philippines for hundred of years, this is one of the thousand churches built under them which still stands firm and proud. Nearing dinner, our driver/guide Mang Chito brought us to Sinugba ni Abdul, an open air restaurant, famous for the Ati-atihan chicken. The food is totally great and is not heavy on the pocket. The grilled squid is also delicious. Mike fetched us 5:30 a.m. and took us to Alona Beach, where our big boat awaits us. 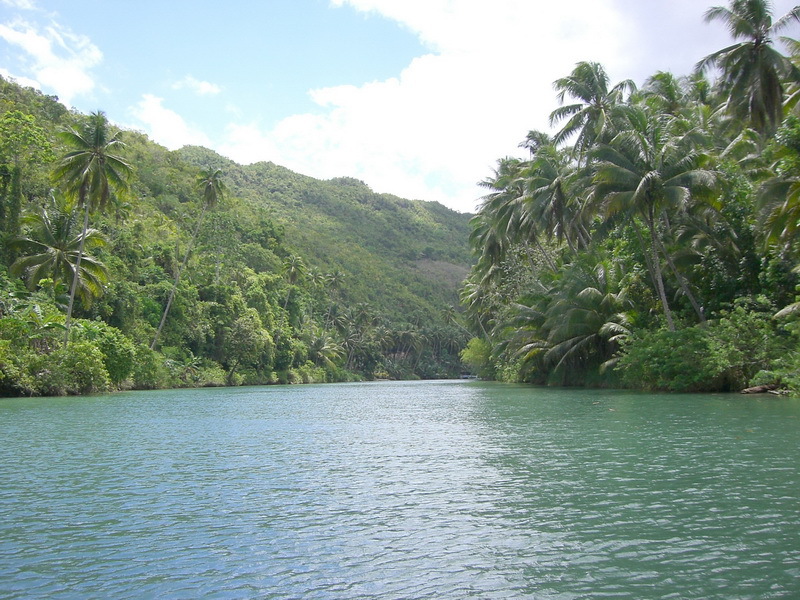 We headed for the sea near Pamilacan, to spot on dolphins roaming that area. We are lucky to be able to see them at their natural habitat. They freely swam and jumped and made twists. It was fun especially at times when they swam beside the boat. There are more that 2 dozens that morning. As I’ve learned, in a day the place reaches a thousand dolphins visits. It is where they eat Galunggong. There are 7 dolphin species there and sometimes there are also whales. We also went to Balicasag Marine Sanctuary where some of my friends snorkeled. The water is pretty clear and calm. From the boat you can even see the bottom with corals and blue fishes. Before lunch we went back to Alona and rode trikes to Dumaluan and spent most of the afternoon lounging on the beach. It was low tide that time. That afternoon, we went to St. Joseph to celebrate mass. We waited at the town plaza, where at exactly 6pm, the black birds would fly from the cathedral to the bare tree, and they would sit there and adorn the tree as if they are leaves. At the mass, the choir sang and sounded great as well as the priest. Bohol is always alive with their people and with their music. It shows the festive spirit of Pinoys. It is very easy to fall in love with Bohol . The place is rich and it won’t fail to make you wonder. You would be asking for more and it will give you more than you expect. With hearts not wanting to leave and with boxes full of heavy pasalubong, we boarded our Supercat to get to Cebu, where we’ll also be touring around, just hitting two birds with one stone, I guess. It’s so much fun that we were able to see and experience so much in a day. We arrived at Cebu port after two hours, Kuya Allan fetched us. We were cramped inside the vehicle with big boxes and bags and all. It was noon, when Arch. Dondon and his family invited us for lunch at Ayala Center Cebu. We ate yummy and greasy CNT lechon(spit roast pork) with puso or rice in a heart shaped wrapping. A very authentic meal, lechon with vinegar and not sarsa, the way Cebuanos loved it. After a hefty meal, Divine went with us to buy danggit(dried fish) and etc. We went and bought danggit and dried squid to our hearts delight. We also bought some dried mangoes and fresh mangosteen. Then we rushed ourselves to Magellan’s cross. We even passed along Colon Street, which is the oldest street in the country. And we went to buy guitars. Cebuanos are known for their craftsmanship and their love for music. Then we rushed to the airport, only to be notified that our flight was delayed so it was our luck. We were able to see other sites in Cebu. 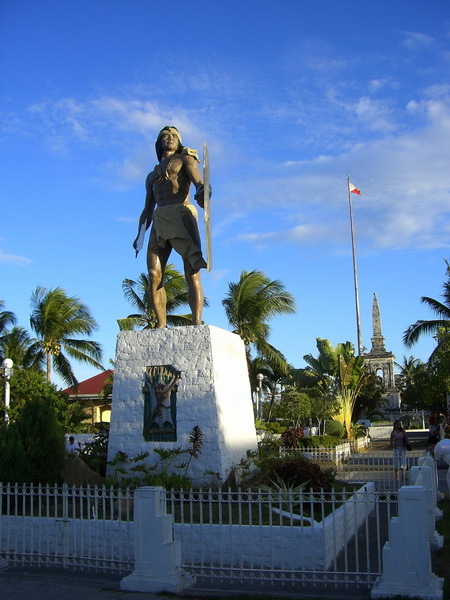 We went to Mactan Shrine where a big statue of the country’s first hero Lapu-lapu stood brave. Then there was the urge to buy lechon, we felt like we were hunting for treasure. Every shop we got to runs out of it. We ended up circling the whole of city for that hard to find delicacy. We got lucky at the CNT fronting SM. We held on to our boxes. With the taste of sinugba still haunting us, we asked Divine is she knew a restaurant for grilled food, we ended up in “New Larsian”, sinugba mecca. It was more than we asked for, it was a compound filled with stalls offering grilled food. We ended up on filling up with blue marlin, pork, chicken, liver barbeque with puso, ofcourse. We ate with our hands because that’s the custom there, no utensils but water and soap to wash our hands with. All in all, our Cebu trip is fun. The food and people are great. It’s cosmopolitan and also laidback and minus the pollution of a city like Manila. It’s so much fun that we were able to see and experience so much in a day. 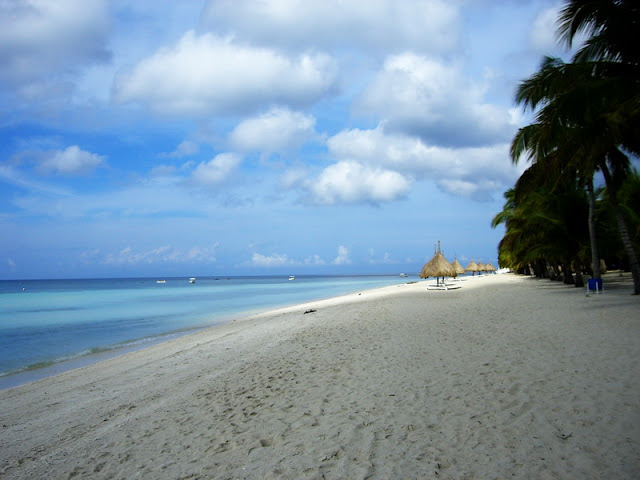 And I can’t wait to see the parts of northern Cebu for the fabulous beaches also.